This package is designed for entrepreneurs who need the works. I work one-on-one with you to delve deep into the heart of your brand to reveal a final product that is not only beautiful, but strategic and effective as well. By the end of our 4 weeks project together, you'll be equipped with the knowledge and tools to catapult your brand. Having a professionally designed brand and website can help your business stand out from the crowd, while increasing sales and conversions at the same time. In our fast-paced digital world, your brand and website gets one chance to engage and captivate your audience. Make sure you get it right with an effective and beautiful brand and website design that is strategically created to promote your business's success. Leave the stress of trying to design your own brand behind so you can get back to doing what you love- running your business. WHAT DOES THE BRAND + WEBSITE PACKAGE INCLUDE? 4 Marketing Materials / Collateral Items of Your Choice: Business Cards, Letterhead, Thank You Cards, Postcards, Restaurant Menus, Brochures, Sticker or Stamp Design, Invoices, Contracts, Print or Social Media Campaign, Media Kit, Poster, Newsletter and more. Thinking of adding a blog to your site? I can help by creating easily-editable custom templates in Canva as one of your marketing materials. 1 Hour Of One-On-One Training so you can feel confident using your new website. Not a writer? While website content strategy and page copy recommendations are included in the Brand + Website Package, some of our clients need a little extra support. This add-on allows you to work with our expert copywriter to bring your brand's story to life. Strategically articulate your message so you can reach your dream clients with efficiency and ease. Get in touch for a custom quote. Click an image below to see the full Brand + Website Design Package project. "Here's my bottom line: Working with Ali has been nothing short of a delight, a relief, and a revelation. Really. After checking out some seriously talented designers, I knew Ali was the one. In showing me her first ideas for the mood board, this knowing was validated in a "knocked-it-out-of-the-park" way. That continued every step of the way from her design work, professionalism, and her very essence. It is quite something for someone to "get" you and your work, and then articulate that through design and craft- it's the very act of being seen for who you are. I feel Ali parlayed the breadth and body of my work in stunning ways that I would never have conceived on my own. The immediate, and continued feedback, I hear about my site is that my designer "nailed it". There are lots of "oohhs and ahhhs" and I am happy to report, a huge uptick in sales and inquiries. And here's probably the greatest testament to her artistry- the logo she created for me? It will be my first tattoo." After you've booked your project, I'll send you a brand questionnaire to complete so that I can gain a deeper understanding of your style, preferences and goals. I’ll also have you send me any inspiration you’ve collected (Pinterest, references to anything you love) and any extra details you want me to know. The first step of your custom branding design is the creation of a mood board. A mood board is a collection of inspiration that will serve as a starting point to get the mood of your brand going. After studying your brand questionnaire and goals, I’ll create your first set of deliverables. This includes your custom color pallet accompanied by the brand mood board. 3 rounds of revisions. It’s the part you’ve been waiting for- your logo mockups! During this phase, I’ll send you 3 unique logo designs to choose from. During this stage, I'll create the rest of your branding elements: alternate logo or sub mark, patterns / textures / illustrations, font selection and style guide. 3 rounds of revisions. Your 4 collateral items of choice will also be designed at this time. Examples include: business cards, letterhead, flyers, sticker or stamp design, poster design, contracts, invoice design, print or social media campaign and more... 3 rounds of revisions on each item. After we've created the solid foundation for your brand, we'll implement the design with a new website. Your website will be created on the SquareSpace platform, which allows for easy updates after the design process is completed. We'll add any blog options or e-commerce, depending on your business's needs. 3 rounds of revisions. After all items are approved, your website will go live, and we'll bring everything together to finalize your exciting new branding package. 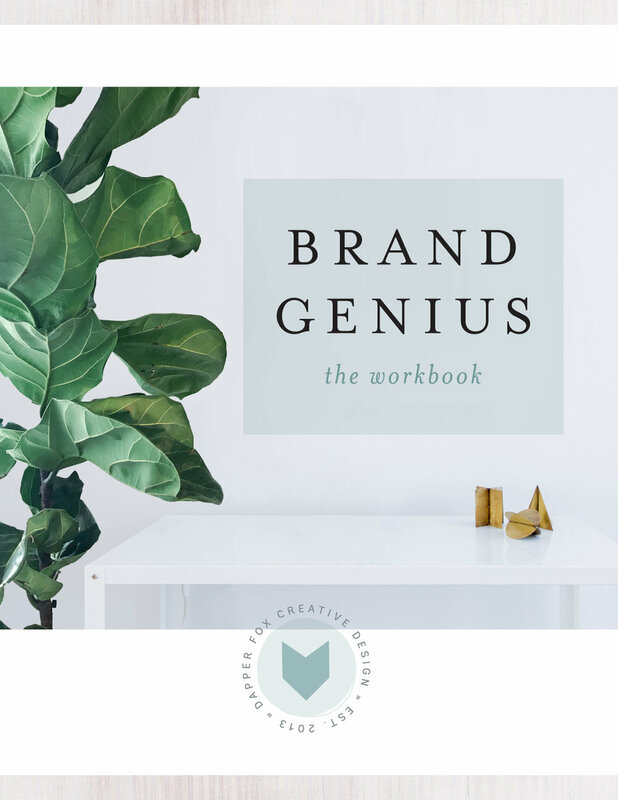 Included in your final branding package will be your new logo, logo variation, color palette, patterns/textures, fonts, mood board, images used on website, etc. Your final deliverables will be sent in a Dropbox package so you can use it for all future projects. Fill out the contact form below to get the ball rolling and we'll schedule a quick, no-strings-attached call to get acquainted. We'll chat about about your business, brand and website goals, and answer any questions you have about the process. Once you decide you're ready to pull the trigger, we'll reserve your spot in the booking schedule and get to work creating a brilliant brand together! PS - If you haven't yet, head on over to the design portfolio to make sure we're a good match.